Mix the meat ingredients together and set aside to marinate while you prep the vegetables. Keep them covered and cool. Have all of the vegetables ready and near the stove because things happen quickly toward the end of this process. Have a cover for your pan on hand as well as two large wooden spoons (or other implements to stir-fry with) In a wok, or large frying pan, start the meat mixture cooking over medium-high heat. Spread it out fairly thin and allow it to brown lightly on the bottom. As soon at it starts to brown add in the onions and start breaking up the meat. After two minutes add the broccoli slaw, carrot and bell pepper and drizzle the hoisin sauce into the pan. Add the green cabbage and stir-fry it until it starts to wilt and brightens in color. Then add the red cabbage and stir-fry an additional minute. Cut the heat to low and cover the pan allowing the vegetables to steam in their own liquid for a minute or so. If there are excessive liquids in the bottom of the pan you can remove the lid, turn the heat up high and cook them down briefly. Just before serving toss the mixture lightly with the sesame oil to give it a bit of shine. Then use a slotted spoon to lightly fill each of the lettuce leaves and serve. Additional hoisin sauce may be served alongside (or use a squirt bottle and decorate the plate with it) Each (3 leaf, app 1 cup) serving contains an estimated: Cals: 191, FatCals: 95, TotFat: 11g SatFat: 2g, PolyFat: 3g, MonoFat: 6g Chol: 45mg, Na: 256mg, K: 444mg TotCarbs: 12g, Fiber 3g, Sugars: 4g NetCarbs: 9g, Protein, 12g NOTE: The choice of vegetables was based on what was in our refrigerator. There's a lot of flexibility here. Cucumbers, jicama, bok choy, french cut green beans, or other suitable items could certainly be substituted based on availability. 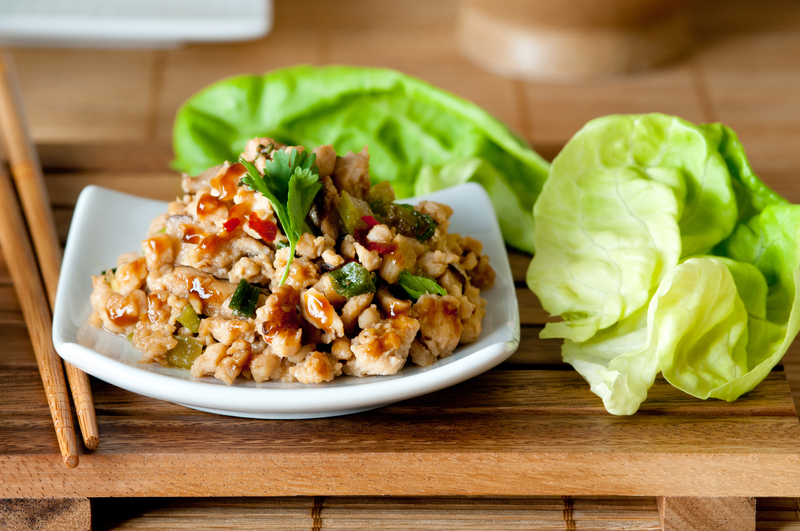 Ground pork or chunks of fish could substitute for the poultry if you wish.